In recounting the stories he fell in love with as a child, Gaiman introduced himself to a few hundred of his Indianapolis-based fans — mostly Gen-X and Gen-Y — all huddled together last Friday in the obscure North Central High School auditorium. For those who stumbled upon the intimate event, Gaiman delivered the Indianapolis-Marion County Public Library Foundation’s 33rd Annual Marian McFadden Memorial Lecture, joining the ranks of the city’s long history of lecturers, who have included Kurt Vonnegut, Tom Wolfe, John Updike, Amy Tan, Judy Blume and others. Gaiman’s fantasy stories, such as Coraline, originally illustrated by Dave McKean, stem from a fascination with houses and with dreams. In 2009, the same year Gaiman won the Newbery medal in children’s literature for The Graveyard Book, Coraline hit high definition 3-D movie theatre screens. Just for good measure, he wore the same custom-made Kambriel jacket that he wore to the Oscars in support of Coraline to Indy’s McFadden lecture. A Friends of the Library Foundation representative told the audience they chose him as guest speaker, because he’s considered among the top ten living post-modern American writers, encouraging young readers to become the future of library supporters. 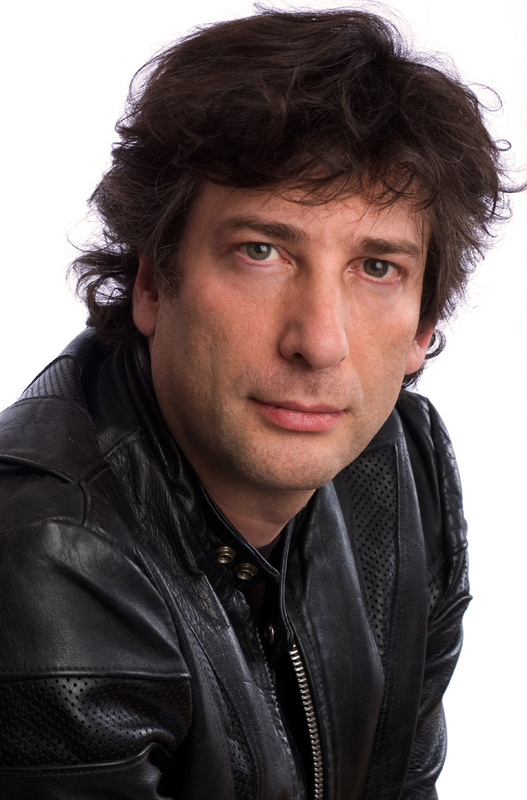 Stories based on truth, or on true legends, thereby have also inspired Gaiman’s work, such as the short story, “In Relic Auryn,” which he read to the McFadden audience. There’s a graveyard on the island of Iona in Scotland where the kings of Scotland and Norway are buried. When the saints landed there, they said, “We’ll build a chapel.” It’s what saints did when they landed. So, one saint entombed another, Saint Auryn, underneath the holy chapel. After three days, they dug him up, and from behind the mask of death, he sat up and gasped, “God is not what you imagine. Nor is Hell, nor is Heaven.” A saint stuffed earth in his mouth to shut him up. And so, Auryn holds the foundation of the church and is the only saint buried on that island. and above all else, trust your stories.